Until recently the promotional hoo-hah was of only peripheral interest to me, as I was heartily sick of listening to Craig's debates, especially after those with Lawrence Krauss and Sam Harris, both of whom have original things to contribute about their respective fields, but whose points Craig roundly ignored. 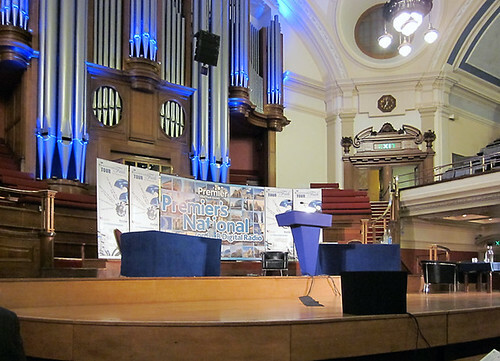 When Polly Toynbee withdrew her name from the tour's speaking list after having initially accepted, I sympathised with what I considered a wise decision. For myself I felt I'd had enough of Craig, and I wasn't interested in attending any of the tour. When Stephen Law "stepped up to the plate", however, I felt differently. Here was a professional philosopher, known as an atheist and clearly a deep thinker — as his previous appearances on Justin Brierley's radio programme Unbelievable? had demonstrated. Suddenly the prospect of yet another William Lane Craig debate became intriguing, as perhaps this time the Craig steamroller might have something concrete and unyielding in its path. 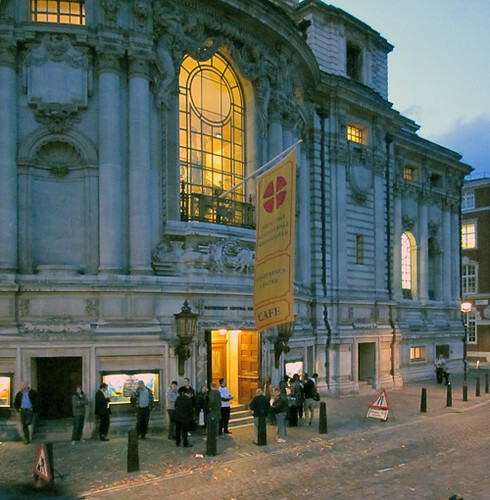 And that's why I found myself in Westminster Central Hall on Monday 17th October, for the initial event of William Lane Craig's Reasonable Faith Tour — a debate between a Christian and an atheist on the question, "Does God exist?" 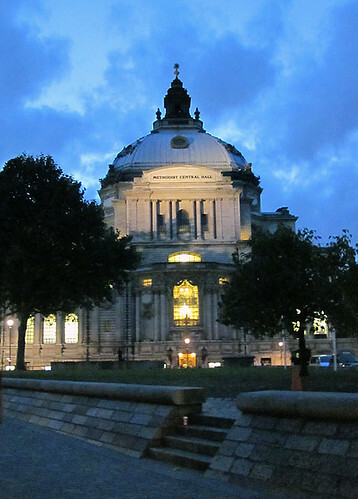 I had arrived early to secure a good seat in the magnificent and capacious building, and was in the third row. I made my own estimate of its seating capacity — about 2000 on two levels. I thought it likely that the lower level would be mostly filled, probably to about 900 (a good crowd by any standard, for an event such as this). But as 7:30 approached — and I'd witnessed the separate arrivals of William Lane Craig and Stephen Law — the upper level began to fill up too. Five minutes before the start I estimated about 1800 people were seated in the hall (Justin Brierley has since mentioned an attendance of 1700, so I wasn't far out). Stephen Law isn't best at the podium — his approach is probably better suited to the discussion or small seminar format. William Lane Craig on the other hand has the big speeches to big audiences down pat — but this is nothing new. Anyone who has seen a few debates by Craig knows what to expect, so I should not have been surprised to hear him launch into three of his tried and tested arguments: the Kalām cosmological argument, the argument from objective moral values, and the argument from the resurrection of Jesus. In terms of presentation Stephen Law is not as slick or as superficially convincing as William Lane Craig, but in terms of philosophical engagement Law can clearly hold his own. I shall not detail each speech here — this has been extensively done elsewhere*, and the unedited audio of the entire two hours is available for streaming and download at the Unbelievable? website. What follows are mostly my immediate impressions of the evening, jotted down during my return train journey that night, interspersed with retrospective comments. I expected Law to use his Evil God Challenge — and he did, in my view to solid effect, and Craig's efforts to brush it aside were, in my view, ineffective. As usual Craig spoke first, and as usual he attempted to define the scope of the debate by stating what his opponent must do in order to refute him. The reason he does this is so that when he sums up he can point out anything in his list that his opponent didn't address, and claim victory by default. In this case however, Stephen Law — speaking second — made it clear that he would present one argument only. Then he presented his Evil God Challenge, which I've heard him deliver before but never with such clarity and depth. The Evil God Challenge goes something like this: the evidential problem of evil is well known — with so much gratuitous suffering in the world, both now and in the past, how could an omnipotent, omniscient and omnibenevolent God allow it? Theists have developed theories — theodicies — to explain how such a good God could allow so much suffering, so much "evil". Whether you think these theodicies are effective reconciliations of the problem of evil will probably depend on your own perspective. The effectiveness or otherwise of these theodicies, however, isn't relevant to Stephen Law's Evil God Challenge. Even if theists try to explain suffering by claiming it's an inevitable result of God allowing us free will, or that we cannot know the mind of God and he might have good reasons unknown to us to allow so much suffering, or that suffering is necessary in order to throw goodness into sharp relief — all of these arguments (or theodicies) can be applied in reverse to the idea that the universe was created by an omnipotent, omniscient but omnimalevolent God who is seeking to maximise the amount of suffering in the world. But how can the Evil God exist when there's so much good in the world? The evidential problem of good is just as effective in disproving the existence of an evil God as the evidential problem of evil is in disproving the existence of a good God. The two scenarios aren't necessarily entirely symmetrical, but they're symmetrical enough to maintain that if observation is sufficient to dismiss the Evil God Hypothesis — and most people seem to agree that it is — it's also sufficient to dismiss the Good God Hypothesis. Craig tried to refute the Evil God Hypothesis — or rather, to shrug it off — by simply defining his God as good. But this is an arbitrary definition that can be just as simply reversed, as Law demonstrated. Law quite rightly called out Craig for resorting to the mystery card — Craig predictably claimed that we cannot know what's in the mind of God — that God might have morally sufficient reasons to allow suffering, reasons of which we're unaware. That's not good enough, as Law pointed out. 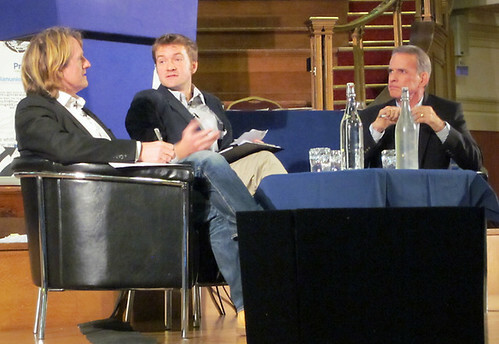 During the post-debate discussion Law objected to Craig's claiming he had conceded that the cosmological argument was proof of God's existence because he didn't address it. Craig defended his tactic as legitimate in the debate format, which goes to show that he's not debating in order to get closer to the truth, and it reinforces the widely held impression amongst atheists that Craig is only interested in point-scoring. Law then took the opportunity to answer Craig's cosmological argument with a simple statement that he doesn't know why the universe exists, but that doesn't give theists a free pass to say their God did it. As Law further explained, just because he doesn't know what, if anything, caused the universe, he is nevertheless justified in ruling out certain hypothetical causes. One such is the Evil God, and by reflection — the essence of the Evil God Challenge — another is the Good God. Law also rebutted Craig's evidence for the resurrection of Jesus by citing corroborated UFO reports, showing just how flawed human cognition can be, even en masse. I think Law put up a good case against Craig, who is acknowledged as a formidable debating opponent. 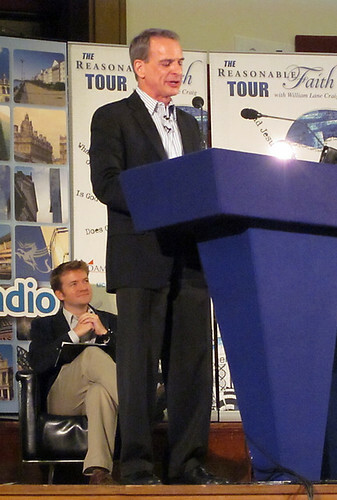 Craig's success at debating, however, relies less on his arguments, which have multiple flaws — some of which Law highlighted — than on his debating style: speaking first, defining the limits of the topic, and listing what his opponent must do to refute him (regardless of what his opponent might think). Added to which Craig is clearly an accomplished public speaker, even if he's usually saying much the same thing every time. In the face of such debating prowess Stephen Law stuck to his guns — he had a good argument and refused to be deflected. But he also showed that he's no one-trick pony. He's known for the Evil God Challenge, but he was also able to identify the flaws in Craig's use of the cosmological argument (despite not initially addressing it) and the argument from the resurrection of Jesus. 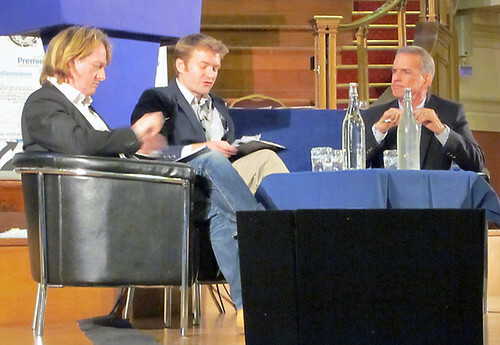 I had originally decided not to attend this debate because I was fed up with William Lane Craig's monotonous repetition of the same arguments, even though I think the question, "Does God Exist?" is the only question in all of theology worth asking (and of course it's the one question theology itself never properly addresses). The reluctance of certain atheists to go up against Craig is understandable. Craig takes debating seriously and is in it to win. He doesn't seem to be interested in an exchange of ideas — rather, it's all about scoring points. Stephen Law, however, appeared wise to Craig's technique, requiring him to address the challenge in depth rather than letting him shrug it off. This was especially noticeable in the discussion at the end, when Craig couldn't exploit the restrictions of the debate format. On the whole I'm glad I changed my mind. This is essentially a response to a post by Clio Bellenis on the Hampshire Skeptics Society blog, "Why I do not call myself a humanist". I'm posting it here as well for completeness, but any comments ought to go over there. Ever since I came to consider myself an atheist (that’s many decades ago now) I’ve maintained that my atheism is nothing more than the lack of belief in any gods. My atheism is not a worldview, though my worldview is necessarily derived from atheism — and I find humanism is the closest fit to that worldview. The “good without God” issue is a clear and straightforward one for me now, though I struggled for a long time with the persistent notion that my moral grounding had to be rooted in Christianity. These days I consider the idea of moral values being based on scripture to be an admission of moral failure — that blindly and unquestioningly following rules handed down from above is an abdication of moral responsibility. It’s far better, in my view, to examine moral decisions based on context and consequences, even if such decisions flout so-called moral rules. The point about “humanism” being the obvious default stance is a valid one, but humanism as a consensus view needs to be seen in the light of what it’s up against. This is especially important in relation to the question of morality. The Christian view, in this officially Christian country, is that it may well be true that one can live a good life without religion, but that the ability to discern good from evil (even when atheists do it) is only possible because of religion (or to use the jargon — because everyone, even an atheist, is made in the image of God). It’s this erroneous view that humanism endeavours to correct, and why I’m happy to label myself a humanist. Wanna hear a spooky story? I don't believe in ghosts. I'm extremely skeptical of the "supernatural", whether we're talking fairies, spirits or gods. But I love a good horror story. PodCastle is a free audio fiction podcast that serves up a short fantasy story every week, and though it's mainly devoted to fantasy (that is, not horror), about this time each year — approaching All Hallows' Eve — it naturally gravitates towards stories of a ghoulish nature. I've a soft spot for PodCastle as I was honoured to be asked to narrate its inaugural episode back in April 2008, "Come Lady Death" by Peter S. Beagle. Since then I've narrated a few more, and the most recent has just gone live, "The Gateway of the Monster" by William Hope Hodgson. Following my review last month of the first disc of this three-DVD set, here's my assessment of the second, which is the Bible Stream. First up is David Instone-Brewer with "Can I trust the Bible?" He begins with a reference in John in the King James Version to some aspect of the Trinity, which is omitted in modern translations because it is reckoned to be something a copyist noted in the margin, and which was then erroneously included in the main text by a subsequent copyist. This is the kind of thing Bart Erhman has been pointing out for years and is probably nothing new. Instone-Brewer goes on to claim that many copies had errors and omissions due entirely to personal whim — such as when someone made a copy for use by his family and censored some passages he considered unsuitable for a family audience. For me this calls into question the accuracy of even the earliest copies. Even though there are thousands of handwritten copies there are no original manuscripts, but Instone-Brewer claims that the profusion of copies allows scholars to infer the original from the many slight differences between the many copies. That's all very well, assuming that the the copies derive from different levels of the biblical "evolutionary tree". But what if they all derive from a single, early copy that contained significant errors? The closer any early copy is to the original, the fewer examples there will be on which to perform such statistical inference, and the less likely any errors are to be correctable. In fact statistical inference will probably reinforce such errors rather than detect and eliminate them. Instone-Brewer seems to contradict himself when he says "nothing is lost", only a few minutes after declaring his opinion that the ending of Mark is, in fact, lost. He also claims, "Thousands of copies, thousands of problems, but we've got the original." Except, as he's already explained, we haven't got the original. He claims to be able to derive the original, but I think his confidence is misplaced, especially as in answer to a question he says that original texts are fragile and don't last very long. They could, therefore, have been copied erroneously, perhaps only a few times, before being lost forever. Many of those errors are likely to be undetectable. He also makes the claim that oral sources are more reliable than written sources. This is a claim I've heard before (from, for example, Michael Licona), but it sounds more like wishful thinking than hard fact. Stories are indeed passed down through the generations, but they are embellished and altered for dramatic and polemical effect — and this is an accepted aspect of the oral tradition. No-one expects these stories to be literally or historically true, especially when those telling them have a specific agenda. Instone-Brewer mentions a stone inscription (apparently now on display in a Paris museum) that describes a Roman Emperor's edict that moving a body from a Jewish grave is to be punishable by death. Instone-Brewer then hints (I think) that this is some kind of evidence for the resurrection of Christ. To me it seems like evidence that the emperor was aware of a religious cult that had persisted after its deceased leader's body had been stolen from a grave, and was anxious to prevent a repetition. Not being particularly well-read in the New Testament I must thank David Instone-Brewer for pointing out so many problems within the text that I wasn't previously aware of. It seems to me that every so-called justification of the reliability of scripture merely points up its inconsistencies and unreliability, as well as the lengths to which Bible scholars will go in their attempts to validate its historicity. I'm not one of those who doubt the historical existence of Jesus, but nothing Instone-Brewer says suggests that the supernatural claims of the New Testament are true. David Instone-Brewer also delivers the second talk on this disc, "Is God a moral monster?" — which is the title of Paul Copan's recent book (which I've not read). He begins by quoting Richard Dawkins in The God Delusion, where Dawkins describes the God of the Old Testament (he has subsequently stated that he included this over-the-top description largely for comic effect). Instone-Brewer goes on to describe the morality of the Old Testament, stating that times were different then, but nevertheless the laws of Israel were far more lenient than those of its neighbours. This may have been so, but such an argument skewers the whole idea of objective morality, making it subject to context and prevailing conditions. He confirms this in an answer to a question about the Ten Commandments, claiming that "Thou shalt not kill" doesn't mean you must never kill anybody. In answer to other, harder questions he simply plays the mystery card — apparently morality was different in the past, so much so that we in the modern world cannot understand it. With regard to sacrifices and slavery he reiterates the claim that the laws of Israel were more lenient than anywhere else. So to modern eyes, it seems, they were relatively less immoral. He answers a question about stoning one's disobedient children to death by going on about drunkards — and I can only assume he didn't properly hear the question. He admits he doesn't understand disproportionate punishment, yet still maintains that God isn't a moral monster. Inevitably there's a question about the slaughter of the Canaanites, and he gives a good explanation concerning how children are honour-bound to avenge the killing of their parents, and the invading forces knew this, and therefore had to kill them to prevent the grown-up children coming after them years later. Unfortunately this contradicts William Lane Craig's insistence (repeated just this morning on BBC Radio) that the children would be glad to be despatched to Heaven. I think it's safe to say that dishonoured children would not be glad to go to Heaven. This last contradiction is yet another example of the contortions Christians will perform in order to twist their faith into places it will not fit. Some of William Lane Craig's points feature in the final talk on this disc, given by Jay Smith: "Is there evidence for the resurrection?" 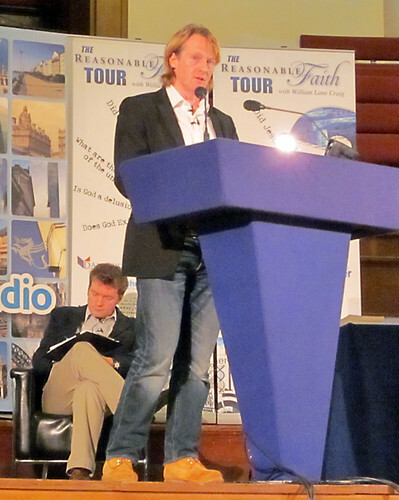 Smith states that the resurrection is central to Christian belief, then says he will use Craig's eight points for discussing the resurrection with Muslims and others. I lost count, but the points he raises are the prophecies in the Old and New Testaments, the mentions by Greeks, Romans and Josephus, the empty tomb and the marble inscription already mentioned by David Instone-Brewer. As in his talk about Islam, Smith soon gets into preacher-mode, which I found a little wearing, but his confident pronouncements seem to rely more on presentation style than logic. He's no more than superficially persuasive, in my view. For instance, I find nothing persuasive about citing Old or New Testament prophecy in support of the actual bodily resurrection of Christ. As has been pointed out, those who wrote the New Testament were intimately familiar with the Old Testament, and they knew what was expected of them. Smith himself hints at this mechanism when he describes the Mithras legends as post-Christ, claiming that the reason such legends are similar to the Gospel accounts of Jesus is that they were copied from them. To me this is applying a double standard. Smith also states that when a messiah dies, the movement that follows him usually also dies, but this didn't happen in the case of Christ, and this is evidence for the truth of the resurrection. The followers of Christ, however, would have been aware of this tendency, giving them strong motivation for somehow claiming that their messiah was still alive. Jay Smith has comprehensive arguments with which to knock down the Qur'an and incidentally claims it was not written by Muhammad, but hearing his (understandably) biased approach to Christian scripture I have doubts about his other claims. The final disc is titled Big Questions — I wonder what that will be about. So much for "absolute morality". Dean Burnett puts Greenfield's alarmism in perspective. While I support the general thrust of this article — that such debates can be ultimately beneficial to the atheist side, I'm not so sure that "atheists dominate the internet". Straightforward Google searches on "Christian" and "Atheist" appear to contradict that assertion. Alastair Noble must be getting desperate. He wants children to be taught about "intelligent design" in science classes, even though he and his cohorts have never presented any scientific evidence to support it. They often claim to have a way of reliably "detecting" design, yet they never produce it — it's all talk. They object to criticisms that intelligent design is unscientific, yet don't seem to understand what science is. When we try to find a scientific explanation for something we don't understand, we attempt to do so in terms of other things we do understand. With ID there's no such attempt, because ID proponents simply don't have an explanation, or even the beginnings of an explanation. And school science classes are not the place for speculative ideas — schoolchildren should be taught accepted science only. For in-depth analysis and an effective way forward in science education see James Williams' new book How Science Works. Seriously? I mean, really? Demonstrably off-planet crazy. How do we know that we are not brains in vats? That we aren't software simulations in an advanced super-computer? That the entire universe of which we think we are a part wasn't created intact (complete with all our memories) last Thursday? We don't. We can make a basic Cartesian assumption that "thinking" of some sort is going on somewhere, by the fact that we use thinking to make that assumption. But apart from that, we really don't know. So where do we go from here? If we can't know anything, what's the basis of doing anything? Why go on, in the face of such uncertainty? We have senses that seem to show us the world in a generally consistent way, so in the absence of certainty we can proceed in what appears to be a pragmatic manner. In the absence of certainty we can construct a worldview based on probability. We can live a life of induction, but we must first assume that induction works. Our senses may subsequently tell us that such an assumption appears to be consistent with reality as we perceive it. And so we build. Of such pragmatism is civilisation wrought — in sweat, in toil, in reasoned argument, in compassion. It is, we find, worth striving for. For some people this isn't enough. They're unhappy with such uncertainty, and demand to be told in no uncertain terms, how things really are. Such people will search for certainty, and believe they find it in religious scripture. They will seize upon the sacred text that purports to reveal in no uncertain terms the secrets of the universe. They will base their lives upon it, proclaiming its inerrancy. It must be inerrant — it's the truth they've been seeking, and if someone is so crass or unwise to question the inerrancy of scripture they'll explain, at tortuous length, why it contains not a single contradiction, and how it grounds their very existence. But they're wrong. They're no better off than the rest of us — in fact they're worse off, having deluded themselves into thinking they are certain, in a world where certainty is impossible. 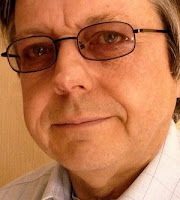 Many thanks to James Williams for being our guest on Skepticule Extra. This show covers science teaching, statistical religiosity in Britain and the mendacity (or otherwise) of the Jehovah's Witnesses (including the editorship of the Watch Tower). Theology: "The study of the nature of God." That's not the only definition, but it's a popular one and it's the one I'm using when I say I don't care about theology. As evident in the recording Alex is knowledgeable about the Christian Bible and has several questions for Matt concerning such matters as the omniscience of God, original sin and how Jesus could be fully God and fully human at the same time. Matt is also knowledgeable and had answers for these questions. That's not to say that these answers were acceptable to Alex (or to me), but the point is that Matt had answers. Theologians and apologists always have answers for such questions. On the matter of Jesus being God and man, the answer was plainly nonsensical (as opposed to only vaguely nonsensical in the cases of God's omniscience and the concept of original sin). But you're never going to get sensible answers to such questions, because the answers are designed to be nonsensical. Take the Trinity, for example — the only answer any theologian or apologist can give as an "explanation" of the three-in-one is to play the mystery card. If the Trinity could be explained in everyday, straightforward language that actually made sense, it would cease to be extraordinary, and without such extraordinary elements Christianity would be a mundane belief system that failed to move people. By including elements that are impervious to explanation and rational analysis, a belief system becomes "special", "mysterious" and "transcendent". In some ways such a system resembles conspiracy theory — belief in something against the trend, being party to secret knowledge, and belief that one has discovered a path to a higher power. This is the Unbelievable? 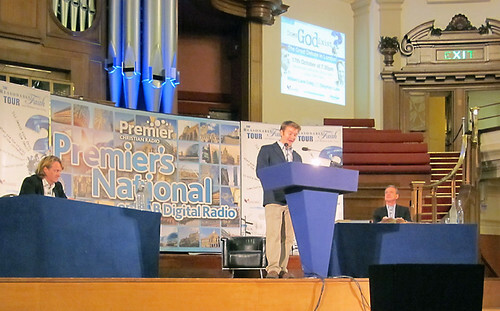 programme in which Peter S. Williams answered questions from listeners, coincidentally including one of those Alex raised with Matt: "How can Jesus be both God and man? ", "Is there any evidence that Christians really have a 'relationship' with Jesus?" and "Was Jesus a failed apocalyptic prophet?" There are theological answers to these questions, and if you accept theology as a path to knowledge you might find Peter's answers acceptable. I don't, and I don't. In fact I find the questions mostly irrelevant in the light of theology's refusal to deal with the fundamental question, "Does God exist?" Until that's properly addressed, any study of the "nature of God" is begging the question. Labels: Alex Botten, Fundamentally Flawed, Matt Slick, Peter S. Williams, Premier Christian Radio, theology, Unbelievable? Paul Jenkins Listening to this at the moment. Not kicked anything yet. Paul Jenkins Just got to Sye's complaint about Alex's blog comments. Convenient he exhibits his paranoia at the point his schtick is evidently failing to make any progress. Paul Jenkins Is Sye attempting to provoke Alex into hanging up on him? Paul Jenkins Here's my take on a couple of questions: 1. Is it possible for an omnipotent God (if he exists) to reveal something to me such that I can be certain of it? Answer: no, because "possibility" necessarily excludes "certainty" — that is, the question is incoherent. 2. Is it possible that we don't know anything at all? Answer: yes, apart from the knowledge that "thinking" is going on somewhere. But we function in the world nevertheless — amazing, isn't it? Paul Jenkins ‎3. Is appealing to your senses and reason to justify your senses and reason a viciously circular argument? Answer: no. It's circular but it's not vicious. And appealing to scripture to justify scripture is also circular. 4. Can the laws of logic change? Answer: this question is incoherent because it misunderstands the nature of logic. Logic isn't something over and above the physical universe, it is a characteristic of existence. Without logic there is no existence. Logic is inextricably entwined with existence and causality, and our understanding of it may change with our understanding of reality. Eric's point about the ontology of logic is invalid because his conception of the nature of logic is false. Paul Jenkins Coming to the end now. And I think Eric is about to ask Alex and Jim to repent (if previous experience is anything to go by). Paul Jenkins It was Sye who asked this time, coupled with a threat of Hell. Paul Jenkins Yay! subjective morality! Paul Jenkins Now I'm going to hold my head under the cold tap. Paul Jenkins BTW, Jim's description of Sye's refusal to debate scripture with a non-believer as a "cop-out" is spot on. Sye is effectively refusing to debate scripture with anyone who disagrees with him. Maybe that's why he's so fond of the presuppositional approach — anyone who falls for the binary nature of the TAG is easy prey, while those who don't will necessarily stall at the first question because they realise it's a false dichotomy.